The exclusive interview, kraim, the olympian turned transgender celebrity opening up about life since that ground-breaking reveal. Does she have regrets? Is she dating? And what is the deal-breaker in her relationship with the Republican party? 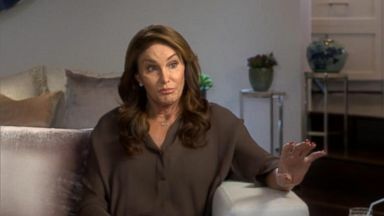 ABC's Diane sawyer spoke with Caitlyn, who says she's now ready to reveal the secrets of her life. Reporter: Almost every day someone goes roaring through the hills of malibu. There a woman in a dune buggy. And there she is again flying her plane over the houses of her children along the beach. Caitlyn, have a great day! Same to you, bye-bye! You can see her two times a week at the supermarket, turning strangers into friends. How are you today? I come around the corner, and this guy goes walking by. Just goes, morning, ma'am. Morning. I kept walking. And I just go, how wonderful is that. Reporter: She'd always said her dream was an ordinary day, an uneventful hello. This may be their only encounter with a trans person. I want it to be a good, joyful experience. Come on, let me tell you what an inspiration you are. What's your name? Matthew. Get the camera out, let's do it. One, two, three. Reporter: Two years ago, this is where it began. Are you a woman? Yes. For all intents and purposes, I am a woman. Reporter: Bruce Jenner, olympic athlete, famous dad on a reality show. Waiting to stun the world by announcing inside he'd always been a woman. And that's very hard for Bruce yep Jenner to say. Why? I don't want to disappoint people. Reporter: In that moment, the anguished, uncertain man we knew as Bruce said farewell. And three months later, this cover of "Vanity fair" would introduce us to Caitlyn. Now my feeling on that picture, I know my kids thought, you know what it's a little too much. But from my standpoint, I had suffered for 65 years. Okay? To have a beautiful shot of my authentic self was important, and the shock value. You wanted the shock value? Yes. I wanted to end the old Bruce, my old life. And that picture did it. Reporter: And then she did it again four months later in a roomful of 6,000 people. It's the espys, the academy award of sport, and she's getting the Arthur ashe award for courage. In this room there are a lot of people who remember Bruce Jenner the 1976 king of the decathlon. A man of unmatched strength and speed mastering the ten olympic events that are the highest test of human endurance and raw masculine power. And now that same person is walking down the aisle in a long white dress. I'd like to thank my family -- Reporter: There, in the audience, the Kardashian stepdaughters and his six Jenner children. The biggest fear I've always had at coming out is I never wanted to hurt anyone else. Most of all my family and my kids. I am so, so grateful to have all of you in my life. Thank you. Reporter: In the two years since our interview, so many young people said they felt safe enough to come forward. The estimate of transgender Americans has now climbed from 700,000 to 1.4 million. In the beginning, she was euphoric. Caitlyn, Caitlyn! Reporter: But so uninformed, she was about to hit all the hand mines. She was asked the hardest part of being a woman. Figuring out what to wear. Reporter: On the "Ellen" show hesitant when asked if she supports marriage equality. If that word marriage is really, really that important to you, I can go with it. It's funny because you're still kind of a little not on board with it. No, I'm on board. Reporter: She now says she's 100% on board. But there was also her reality show. Which tackled some serious issues in the transgender world. But mixed in a lot of makeup, clothes, wine, and the tone-deaf problems of privilege. So many Paparazzi. Reporter: She complained about Paparazzi. While her community faces homelessness and violence. Not talking about Paparazzi, but talking about survival. Survival. The question I think was, and I'm going to go hard -- Hit me hard. The question was, do you really feel what they're living? I feel it and I see it. At the beginning of this whole thing, yes, I knew absolutely nothing. Yes, I made mistakes. On some subjects, I think I was insensitive, honestly. Because I just didn't know any better. It's tough to take 65 years of being Bruce and then like overnight everything changes. At first you don't know how to handle it. We don't want you! Reporter: Some people in the transgender community so angry they shouted her down in the streets. Do you have any idea what's really happening out here? Let's go, come on. You're an insult! I'm not representing you. Don't you Touch her! Reporter: At the same time, internet trolls attacked her for being transgender. Just brutal. Brutal. It's like you don't even go there anymore. What's the kindest thing anyone said? "I love you." People who have thought about suicide and said they wouldn't do it. Reporter: And then last year in the midst of a contentious election, Caitlyn Jenner again in the spotlight. On her TV show her transgender friends are horrified by her Republican politics. Republicans, your people, they don't like us. Here's the deal. Yes, I did vote for trump. Reporter: She says she believed Donald Trump was personally intrusive and that he would surprise everyone on lgbt issues. Here at the convention. I will protect our lgbtq citizens. Reporter: When president trump saw her at his inauguration -- He wanted me to play golf with him. Reporter: But just 34 days into his administration, she was shocked. He revoked an Obama directive designed to strengthen federal protection of transgender kids on their bathroom choice. This administration, for me it was extremely, extremely disappointing. Here's the dealbreaker with the Republican party. And the dealbreaker is, you mess with my community, you don't give us equality and a fair shot, I'm coming after you. Reporter: Strong words from someone who knows what it is to be transgender, even though so many decades she kept it a secret. It's a tough road. It's a tough, tough road. Reporter: And she says, since coming out, she's been lucky to have the money to change her appearance. Jawline, forehead, breasts. And she has just announced in the book that she has become one of the 12 percent of trans women who go on to get what's called final surgery. It's about what's between your ears and who you are as a person. It's your soul. Okay? Reporter: She writes, after much deliberation, I had the final surgery in 2017. The surgery was a success, and I feel not only wonderful but liberated. So all of you can stop staring. But I wasn't less of a woman the day before I had the surgery than I was the day after I had the surgery. Because that did not define who I am as a human being. No regrets? None whatsoever. Reporter: Then she issues a kind of social warning saying, this is a topic only a transgender person can bring up and the rest of us should never ask. So how did you decide to put it in the book at all? This book is about honesty. But that doesn't mean in the future that I have to talk about it, that I'm going to dwell. The media may. But I am not going to dwell on that subject. Reporter: There were also the three marriages. The last one playing out in reality TV. Do I talk to obviously the last one, Kris, all the time? No. She's kind of moved on. I certainly have moved on. But we're fine with each other. Reporter: What about her life ahead? Someone new at her side? I don't -- I don't see really even dating in my future. I have not been approached. I've never been out on a date. In two years? Yeah. Yeah, never been out. I just have a lot of friends. That doesn't necessarily heal loneliness. My life revolves around my kids. And they'll be in my life until the day I die. Yeah, the room's kind of a mess -- Reporter: Her malibu home, now full of memories. Kim gave me that one. These are daughter, stepdaughter -- Yeah, this is a great bag. Reporter: Some of them sent by the Kardashians. Look at the sunglasses alone. They're actually very old. I think actually -- okay. I stole these from Kris. A long time ago. Reporter: Others are just sentimental from the days when Caitlyn could only be herself in secret. I have a terrible tendency to hold on to things. It's like I can't get rid of it because it represents something in my past. Reporter: As we walk into the hall there's a table with a lifetime of awards. She says she wants to concentrate now on raising money for transgender issues. Do you think, in your lifetime, my lifetime, that we'll see full acceptance? No. I don't think we'll ever see full acceptance. Is it going to get better? I hope so. And I hope that I'm part of that. I want to fight this fight. Our thanks to Diane sawyer. Caitlyn Jenner's book "The secrets of my life" will be released April 25th.